Here in this bike pic, we captured a biker chick having fun pedaling around Mankato last year on the Mankato River Ramble. This year’s Ramble is this Sunday, October 7th, see more here. 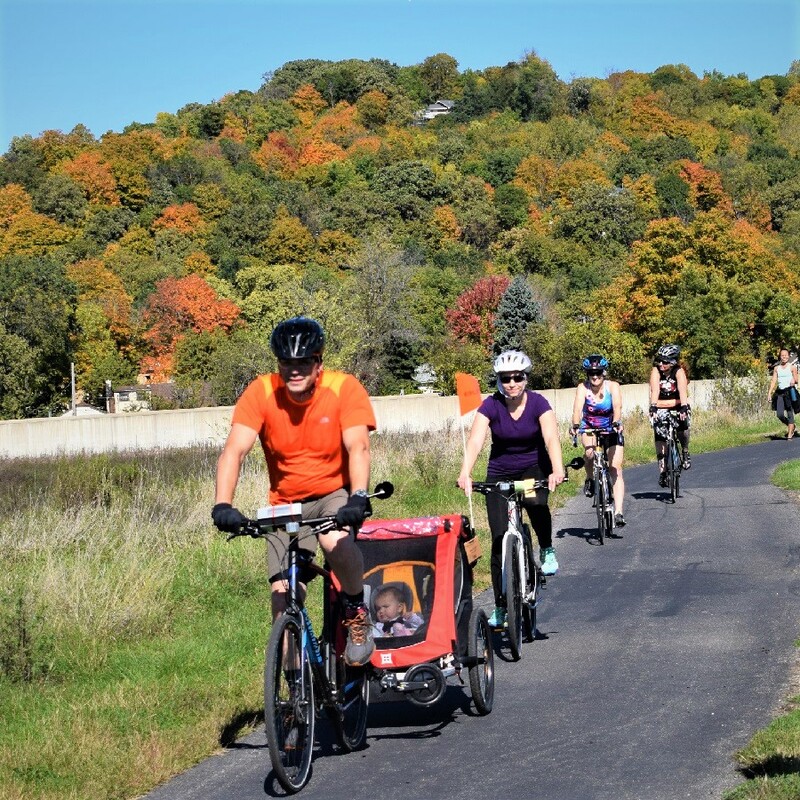 This entry was posted in Picture of the Day and tagged Bicycle Alliance of Minnesota, BikeMN, biker chick, fall bike ride, Greater Mankato Bike and Walk Advocates, Mankato Brewery, Mankato River Ramble, Minnesota bike ride, Minnesota River Valley Trail, Minnesota trails, Peace Coffee, Visit Mankato MN on October 6, 2018 by Russ Lowthian. Here in this bike pic, we captured a group of cyclists having fun pedaling the trails around Mankato last year on the Mankato River Ramble. This year’s Ramble is this Sunday, October 7th, see more here. 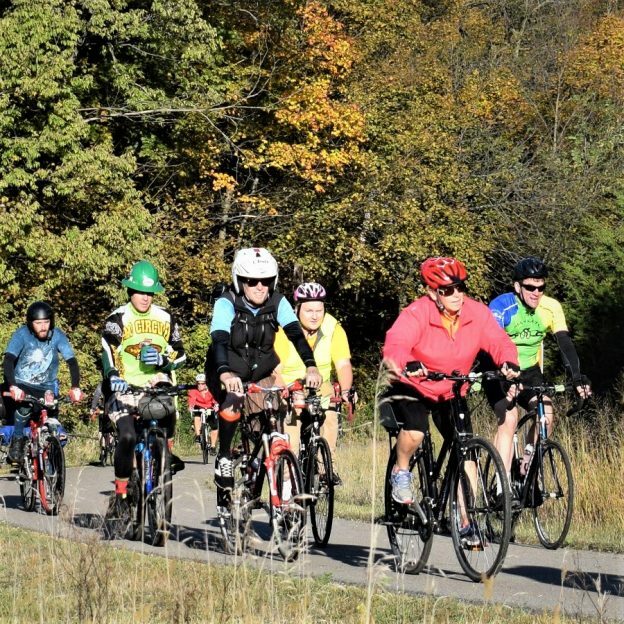 This entry was posted in Picture of the Day and tagged Bicycle Alliance of Minnesota, BikeMN, fall bike ride, Greater Mankato Bike and Walk Advocates, Mankato bike trail, Mankato Brewery, Mankato River Ramble, Minnesota bike ride, Minnesota River Valley Trail, Minnesota trails, Peace Coffee, Visit Mankato MN on October 5, 2018 by Russ Lowthian. 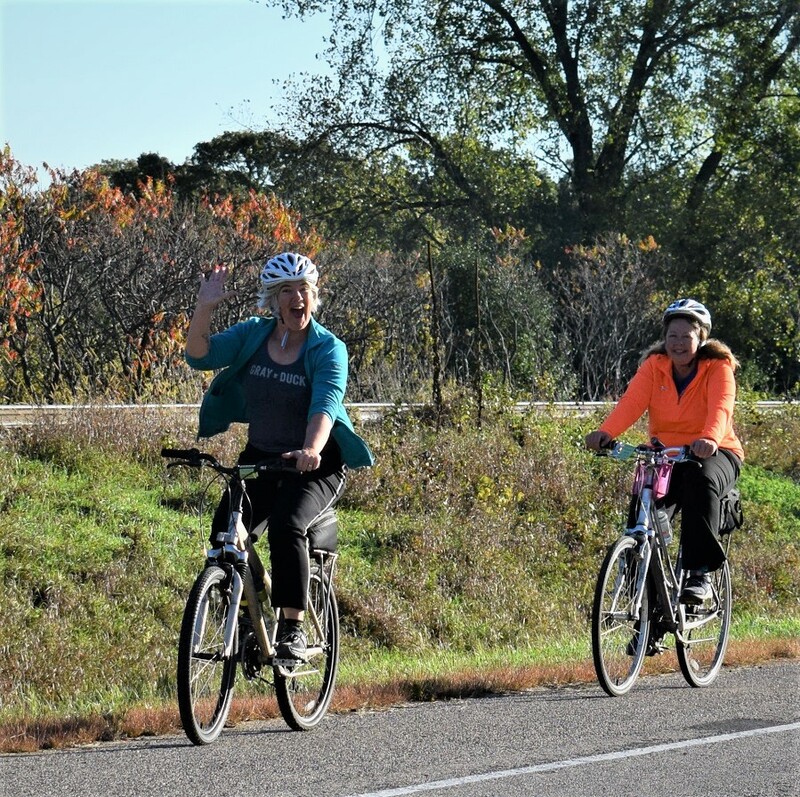 Here in this bike pic, we captured these two biker chicks having fun pedaling the trails around Mankato last year. This year’s Ramble is this Sunday, October 7th, see more here. This entry was posted in Picture of the Day and tagged Bicycle Alliance of Minnesota, BikeMN, fall bike ride, Greater Mankato Bike and Walk Advocates, Mankato Brewery, Mankato River Ramble, Minnesota bike ride, Minnesota River Valley Trail, Minnesota trails, Peace Coffee, Visit Mankato MN on October 2, 2018 by Russ Lowthian. 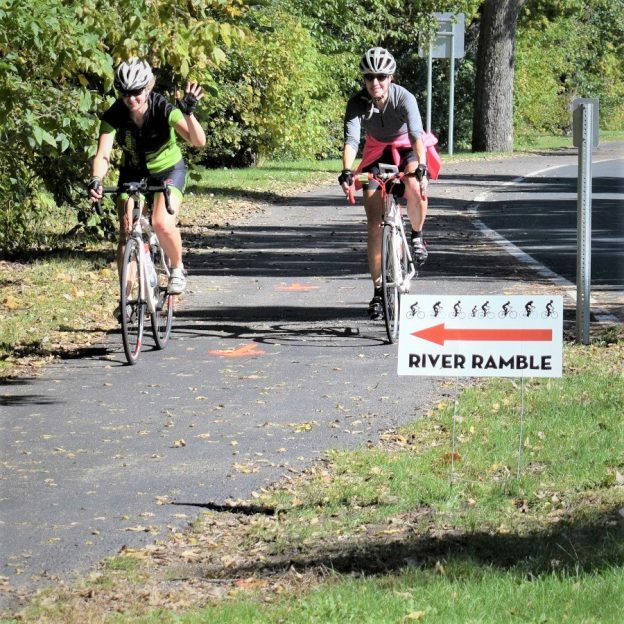 Join some 2,000 bicyclists on Sunday, October 7th for the eight annual Mankato River Ramble. 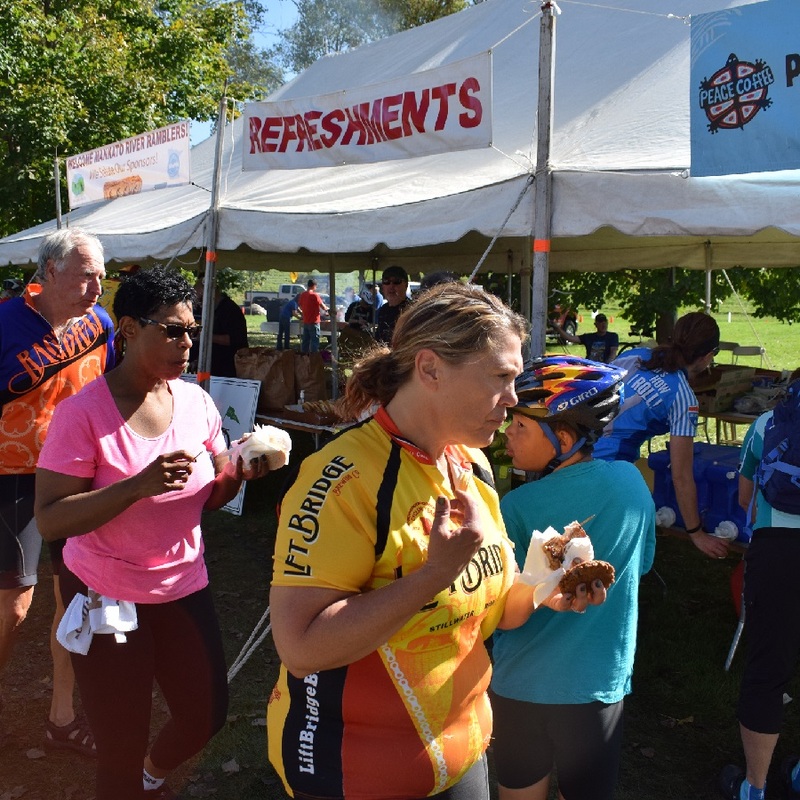 This year’s ride offers three loop options, a 16, 30, or 42-mile route featuring great Rest Stops, ride support, delicious food and beverages, live music and much more. Routes can be easily combined for those who want to add on additional mileage. The whole family will like the scenery along the Minnesota River Valley. Even though early registration has closed, day-of registration is open and available. If you have not pre-registered you can come between 8 and 10 a.m. to Land of Memories Park (100 Amos Owen Lane, Mankato, MN 56001) to sign up and begin the ride. See more info here. Tasty treats, like the pie stop, can make the ride extra delicious. The Ramble wouldn’t be possible without the help of 140 volunteers and sever spots are still open. Volunteer sign-up for the 2018 Ramble at www.bikeriverramble.org/volunteer. Volunteers help with putting up signs, helping with registration, passing out treats at rest stops and encouraging riders. Volunteers get a free Ramble T-Shirt and will be celebrated at the volunteer appreciation party at the Mankato Brewery with amazing food from Pub 500. “Our volunteers are the ones who make each ride what it is. We couldn’t have a successful event without all their donated time. 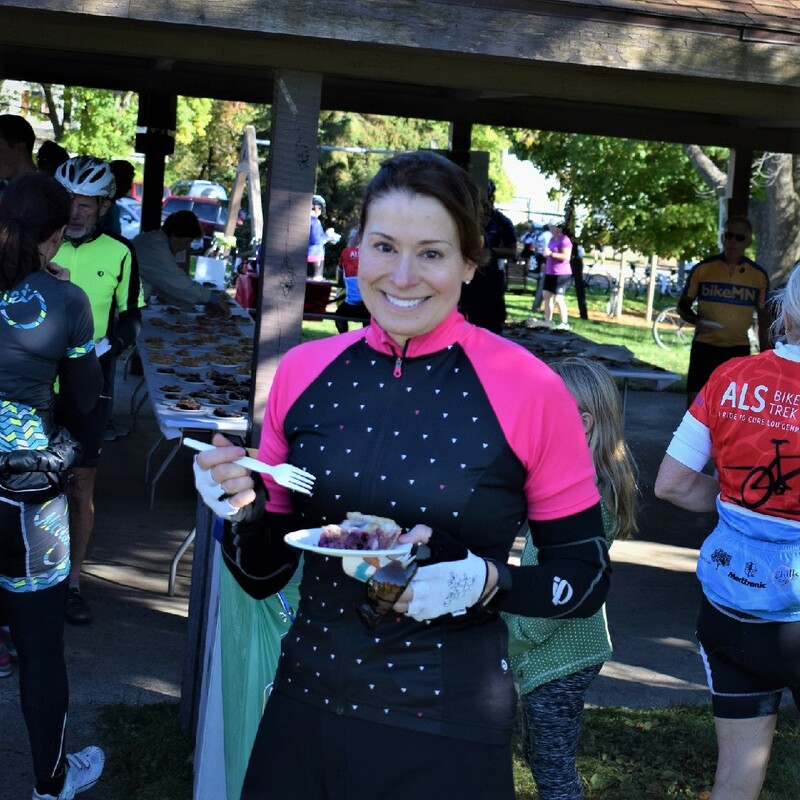 They set the tone of each ride and we are grateful to always have so many generous volunteers at the Ramble each year!,” said Dorian Grilley, Executive Director of the Bicycle Alliance of Minnesota (BikeMN). The Ramble is a fun place to gather and ride with old and new friends! 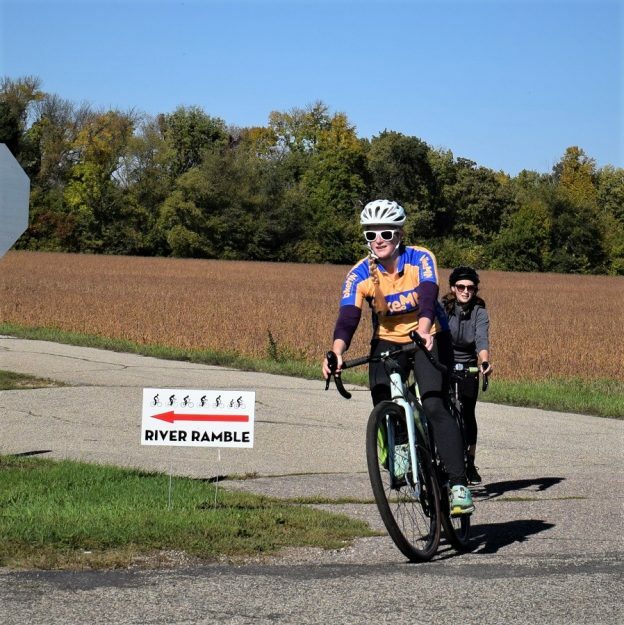 The Mankato River Ramble is a fundraiser for the Greater Mankato Bike & Walk Advocates and the Bicycle Alliance of Minnesota. Proceeds after expenses from the event benefit these two organizations. The ride is made possible thanks to the generous support of the Mankato Clinic and the Orthopaedic & Fracture Clinic, as well as the support of more than 50 other sponsoring organizations. More delicious food upon your return and its included in your ride fee. More photos from 2017 Mankato River Ramble can be found online here. BikeMN is working to make Minnesota a state where bicycling is a safe, easy, fun and cool choice for everyone. 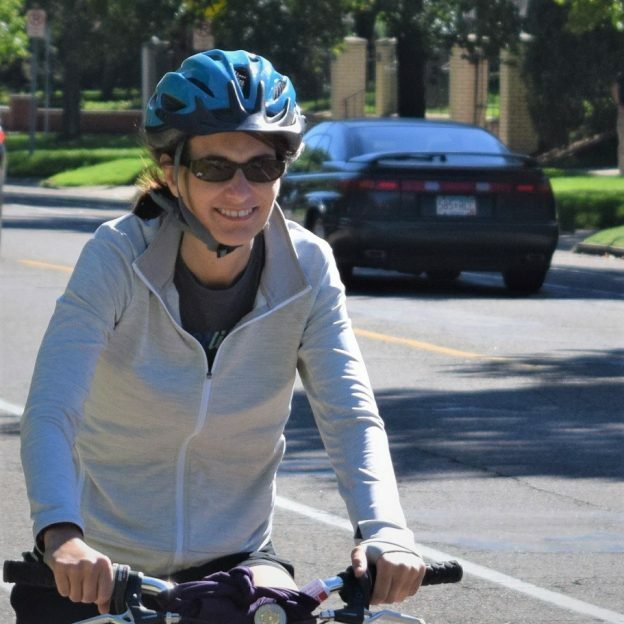 The mission of BikeMN is to provide leadership and a unified voice for bicycle education, advocacy and efforts to make Minnesota more bicycle friendly so that more people will ride bicycles more often. More at www.bikemn.org. GMBWA encourages individuals and families to walk and bike as part of a healthy lifestyle. Greater Mankato Bike and Walk Advocates work with city, county and state governments, businesses and nongovernmental organizations to improve the community’s infrastructure and opportunities for walking and biking. The ride began in 2011, thousands of dollars of profits from the Ramble have gone into signs, outdoor kiosks, and mountain bike trail construction, and other improvements in the Mankato area. This entry was posted in Destinations, News and tagged Bicycle Alliance of Minnesota, BikeMN, fall bike ride, Greater Mankato Bike and Walk Advocates, Mankato Brewery, Mankato River Ramble, Minnesota bike ride, Minnesota River Valley Trail, Minnesota trails, Peace Coffee, Visit Mankato MN on September 25, 2018 by Russ Lowthian.